This project is part of the ongoing re-configuration of a series of buildings centred around a mews in Knightsbridge, for the London-based fashion boutique Egg. 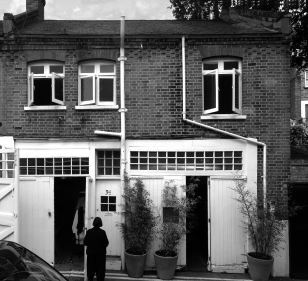 The most recently completed phase is the refurbishment and alteration of one house in the mews to create a new pied-á-terre for Egg’s owner and to provide a much needed expansion of the back-of-house facilities for the adjacent shop. Inspired by the essentialism and pared-back minimalism of the Egg boutique and by the informal character of the mews and the shop, we have inserted a series of containers within the first floor of the building to accommodate domestic and commercial functions. These boxes sit within the volume of the roof and create the nest-like atmosphere of an attic or store room. On the ground floor the project includes a bespoke wooden bath supplied by Studio Anna van der Lei set within a bathroom that opens to the mews and that doubles as a meeting room for the Egg team.